← Does Archaeological Minimalism Apply Only to the Bible? A Very Special "Saturday à Machen": What’s the Name, Please? Nearly a year ago, the Rev Mr Hobbins posted a very valuable note in anticipation of the yearly meeting of SBL in which he ruefully observed, among other things, that certain scholars’ names are routinely mispronounced even by their academic peers, and that surely something ought to be done about that. John’s brilliant and helpful suggestions may routinely be ignored by the ungrateful biblioblogging community, but this is never so at The Voice of Stefan. It is in response to John’s proposal, then, that I post this Very Special Saturday a’Machen for your edification. Here, then, we have as close to a final word on the matter as we can hope for. This text is included in Funk’s compilation, and as I recall, originally appeared in the Literary Digest in 1917. Full bibliographical data for the magazine column is given in Ned B. Stonehouse’s J. Gresham Machen: A Biographical Memoir, my copy of which I regrettably cannot find. I’m embarrassed to say I got the ach totally wrong. I’m glad I didn’t mention this over the phone. If I only would have used regular English (US) pronunciation rules I would have gotten it right. I think it would be interesting to have an index of pictures of scholars. This is wonderful! 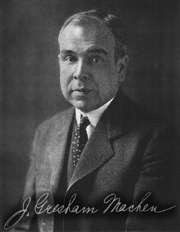 I have consistently mispronounced Machen (in the German way) for some time now. It seems like a mistake biblical scholars would be particularly inclined to make! For the record, I would also like to see something on standard anglicised pronunciations of ancient and mediaeval names. For instance, should we say ‘Cassian’ with a voiceless postalveolar fricative in the middle? *nods* I don’t know anything about him, but from seeing his name in your blog, I was pronouncing it the German way. Aaron> Yes, yes, yes! The problem is accentuated by the fact that his Greek grammar is used by many institutions quite outside the circles of "Machen’s warrior children," among whom the proper pronunciation has been preserved. (I mean, they even use it at Jordanville!) And as you rightly suggest, Biblical scholars who use his text but are unaware of how he pronounced his own name would be prone to pronounce it like German. Maureen> Ah, many thanks for the note! See, every time I saw the name of the horror writer I instinctively read it in my mind as the name of our hero, the biblical scholar; now I know better!